I know I talk a lot about losing weight here, but for some reason I can't seem to commit to the lifestyle change. I know what I need to do, I've done it before, I just need to do it! With only a few days left before I leave for the cruise, it's time to have real talk with myself. I can't go back to the weight I was at when I started all this nonsense 3 years ago (I'm only a few pounds away from my heaviest). Habits need to change and they need to change quick and for good! Everyone needs to hit their breaking point. A moment where there are no more excuses. My moment was yesterday when I was attempting to pack for my cruise. My "go to" shorts and dresses are now obscenely tight and don't look the same as they did last year. I know what you're thinking. "Doesn't she leave in 5 days? How does she think she can change anything in just a few days? Wasn't she supposed to be working on all of this 6 weeks ago?" Well my friends, I failed. I never committed and here I am writing about this all too familiar topic again. So as I had my mini breakdown while packing, I immediately stopped, changed into my gym clothes and went to the gym. Talk about seizing the moment! And boy did it work! I had one of the best workouts I've had in a while. I ran 3 miles in under 30 minutes, did arm weights with 10lb weights instead of 8, and even did 45 second planks in between my three sets! That was just what the doctor ordered! I already feel 10lbs lighter! This weekend I watched history be made. The first ever women's UFC fight was Saturday and boy did it inspire me! A few summers ago, my girlfriends and I joined LA Boxing to get into shape. Not only did we tone up, but I gained the confidence I had always lacked when it came to my body. I felt strong. The fight this weekend made me miss all of that. Maybe that's a sign for me to reactivate my membership?! Enough about me and my struggles, what was your biggest motivator? Also, what keeps you motivated when you want to quit? Sorry for the wordy post, but I think I needed to get all of that off my chest. This week was both short AND fun with a President's Day on Monday and a company holiday yesterday (Doesn't get much better than that!). Next week will be another short week because I am taking Friday off so we can drive down to FL to get on our cruise! I was definitely a busy little bee finishing up the FE gifts. I can now officially say, they are all made! I'm so excited with how everything turned out! I made bows for the girls, key chains for the women, embroidered coozies for the men and bought little Styrofoam airplanes for the boys. On Wednesday, we had a company dinner at Maggiano's and they gave us a 3 liter bottle of wine at the end! It of course deserved a photo op! This picture of Milo cracks me up. I feel like he is going to yell at me. I went on a coozie making binge and decided to make them for the ladies at work. Here are a few of ours in action! Last Friday I met my mom at the local winery, La Grange and even though it was cold and cloudy, the view doesn't get much better than that. It's so nice to have such beautiful scenery just a few miles away from our house. I'm a bow girl. I always have been and always will. In case you don't know, I have a bow collection that can rival any little girls'. That's normal right?! When it came time to brainstorm for the Fish Extender gifts, there was no doubt in my mind what I would be giving all the girls on my list: BOWS! Until now, I have not dabbled in bow making because I could never get them to look like the ones I would buy. However, for this project, I was working on a tight budget and needed to make 13 (ok I made 14 so I could have one, don't judge). Off to Pinterest I went! I was bound to find an easy tutorial right?! Wrong! I wanted easy, no sew, flat but full bows. After hours of scouring Pinterest, I was out of luck. Good news! I finally found a tutorial (unfortunately I can't find that link now because I had dug so deep into the interwebz). Once I practiced and figured out the most efficient way of making my bow, I decided to share with you my very own bow tutorial! 1. Take the wide ribbon and fold in half. At the halfway mark, line with glue. Fold the outer edge to the center. Do the same to the other end﻿. 2. Take your thinner (optional) ribbon and lay it under the first piece. You will fold it over and glue the same way you did the black ribbon. 3. Now pinch the bow from center and add a glue dot to help keep it together. You will then fold back the edges and glue them to the back to help clean up the center. 4. Follow steps 1-3 with your other two pieces of ribbon and you will end up with two identical bows. 5. 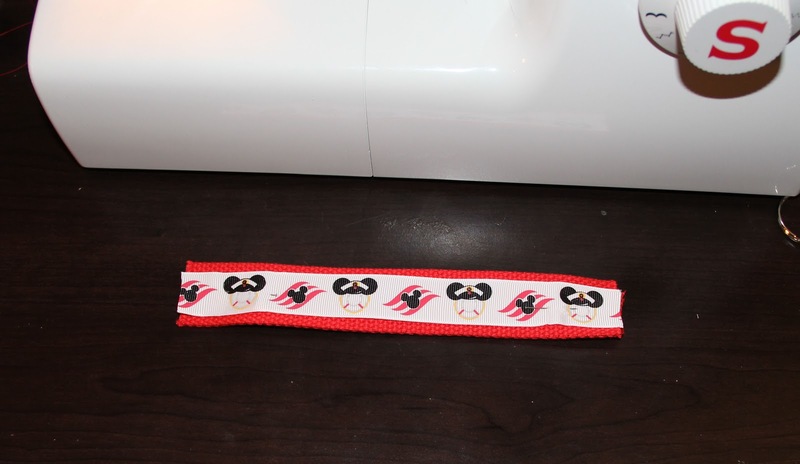 Combine the two bows at the center and wrap the skinny black fabric around to join the two bows and glue. And there you have it. A symmetrical bow made with just a little bit of ribbon and glue. Simply add whatever kind of barrette to the back and it's ready to wear! Linking up with Steph and Katie for Saw it. Pinned it. Did it! Remember how I showed you how to make a fish extender for your upcoming cruise? Well now that you have a holder for all those cute and thoughtful gifts you'll receive, it's time to make gifts for your fish extender friends! I started by brainstorming ideas for each person on my list. I decided to split it up by men, women, girls and boys. Simple enough, right? Today I will show you how I made the womens' gifts. 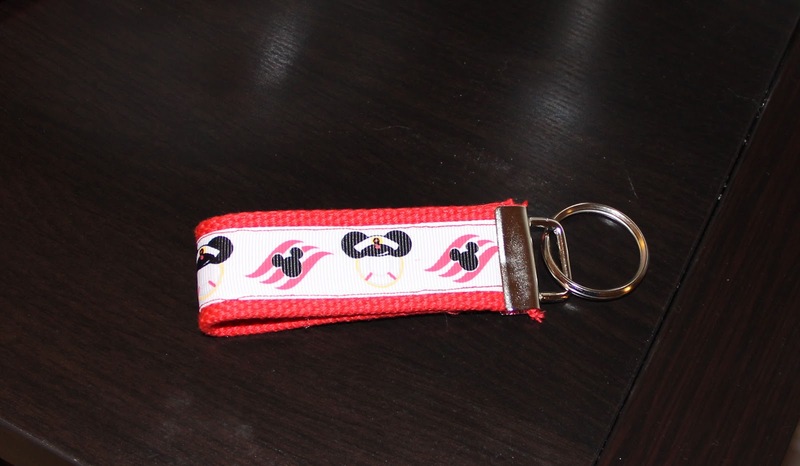 I chose to make cute, fabric key fobs with Disney cruise ribbon I found on Etsy. 1. Cut your ribbon and webbing to 8", (you can choose any length depending on your preference) then pin the ribbon on top of the webbing. 4. 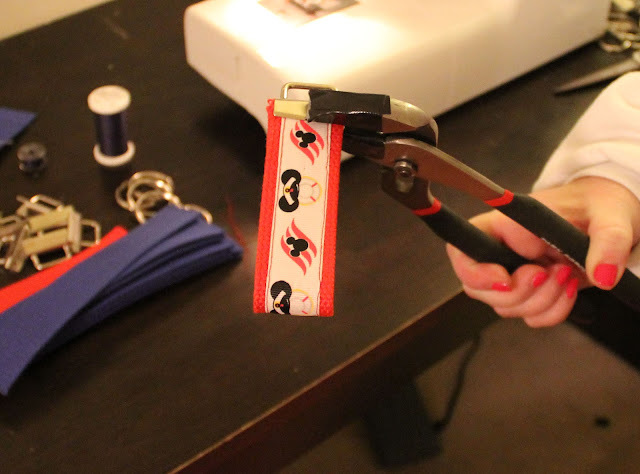 Place your key fob set over top the sewn edge and press down with your pliers. 5. Attach the key ring and there you have it! A cute personable, handmade gift in just 5 simple steps! I can't wait to put these in every one's FE's! Even better, you can make them with any ribbon for a variety of occasions. I am so excited to be reviewing my very first product! Just a few months ago, I was contacted to review a product for Joules. Not being familiar with the company, I did what any girl would do and go straight to their website. It didn't take long before I realized this was just my style. Within five minutes of surfing, I had already made a wish list of about eight things I wanted! For example, these adorable navy blue Wellies with a red bow. When I received my care package in the mail, I had no idea what to expect. I was so excited to unwrap this gorgeous silk scarf! Hmmmm silk. That's super fancy and what your grandma wears, right? Wrong! Sure, by now we all know how to style a good pashmina. It's easy. You can't mess it up! In fact, the less you try the better it lays. But this scarf is smaller and silk, so how do you make it work for everyday outfits? I really like how it compliments and spices up an otherwise plain pea coat, don't you? If you go to the Joules site, you will see all the different women's jackets with scarves incorporated. Tell me, how do you wear your scarves? (Especially square, silk ones!) I feel like they are starting to spring up everywhere! Not only do I love Fridays because that means the start to the weekend, but because H54F is my favorite post of the week! It forces me to look back at all the random pictures I've taken throughout the week and remember the picture-worthy events. Massive Lilly sale that I just couldn't pass up. All of this stuff was on super clearance, we're talking 75% off people! My sorority just welcomed their newest members last month and when I saw these bid day t-shirts on Facebook, I just HAD to have one! They were so sweet and mailed me one. Two of my favorite things; GPhiB and Disney, COMBINED! Milo got a new bed this week and I think he finds it sufficient for nap time. Last night I went to the Melting Pot with a friend for Restaurant Week and it was sooooo good! Who doesn't love melted cheese and chocolate?! Hope everyone has a FANTABULOUS weekend! I'm attempting a long run....dun dun dun! I'll let you know how it goes. 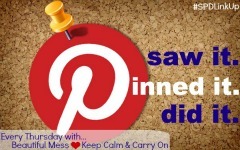 Linking up with Lauren @ From My Grey Desk and Jeanette @ Life Rearranged! I think I've mentioned our "nook" area in the house before ( I was using it as my office), but now I'm excited to share its face lift! For some reason, it is the only room in our house that I just couldn't seem to get right. It was a place that housed all the things your couldn't find a home for elsewhere. It was beginning to look cluttered and let's face it, it was unused space. I wanted to make it functional. A little corner of our house that was all mine. 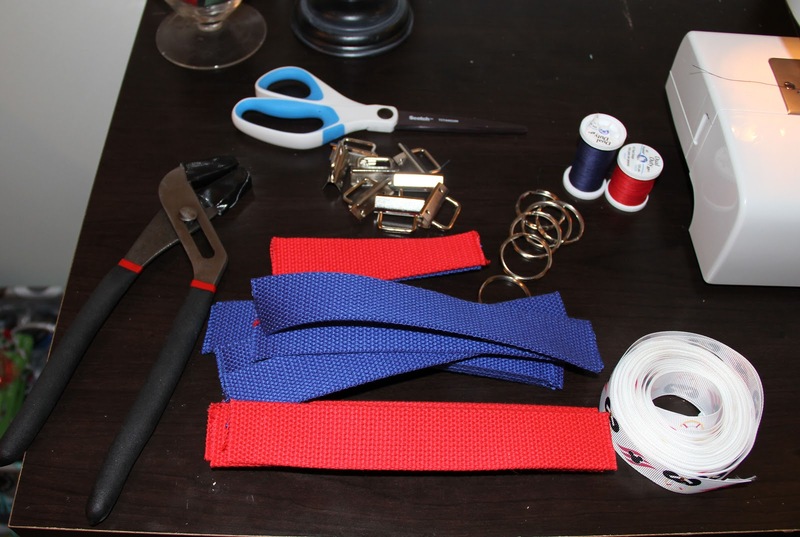 Since I started this blog, I have tried my hand at sewing. And of course I opened my very own Etsy shop and shared some of my tutorials here with you! So what better thing to convert this unused space, then to make it a craft/sewing nook?! Cluttered with no real purpose or function....booooo! So here it goes, I did not spend a ton of money to make this space functional. I mainly re-purposed a few things from around the house and rearranged the furniture. The few items I did buy, I got for a steal and others I made. Alas, my organized, neat and modern sewing nook! Isn't this chair just perfect?! I found it at Home Goods on final clearance and it just HAD to come home with me! It's adds just the perfect touch of femininity to the room, don't you think?! I picked up a few knick knacks from Home Goods to really tie it all together. I used an old apothecary jar from my bathroom I wasn't using and filled it with sewing notions. I stole this lamp from my sunroom downstairs because the colors were too perfect. I of course couldn't help but pick up this sign from Home Goods because the colors were perfect! Lastly, I attempted to make a place to hang my ribbon, thread and scissors. (After bragging to my mom about how I did this all on my own, she proceeded to tell me it needed to be fixed...buzz kill). Good news is, she is coming over this weekend to help me make it just right! I will be sure to post a tutorial for you sometime next week to show you how I made this inexpensive but functional ribbon and thread wall organizer! Hope you enjoyed my little corner and are now inspired to find that place in your house that you can call your own and actually make it your own!